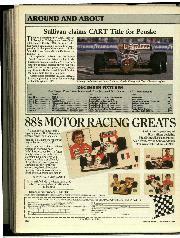 Four races into the 1988 Indycar season, Penske chassis and Chevrolet engines had proved the dominating force, and Rick Mears led the championship after successive victories on the oval speedways of Indianapolis and Milwaukee. Davie Hayhoe travelled to Oregon on June 19 to watch Mears’ team-mate Danny Sullivan complete a Penske hat-trick in front of a record crowd at Portland International Raceway. The sixteen-race CART series is held on a variety of circuits, ranging from the superspeedways such as Indianapolis, through short ovals to road courses and temporary street circuits. The 1.9 mile, nine-turn Portland road circuit, built on the site of a city which was submerged in a flood forty years ago, has hosted an Indycar round for the past five years. Track conditions were almost perfect for the first qualifying session and it was Danny Sullivan who posted the fastest time of the day with five minutes remaining, establishing a new lap record at 116.685 mph. 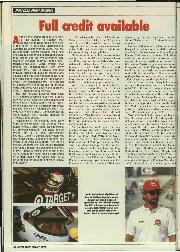 His Penske team-mate Rick Mears, keen to win his third race in a row and prove he is just as good on non-oval circuits, set second fastest lap just 0.2 seconds slower, but then had his time disallowed when his rear wing was discovered to be set back ¼in beyond the limit. Since the final qualifying sessions are held in two parts, with the slowest from the first day going first, this was where Mears found himself, along with the ever-improving Dutchman Arie Luyendyk, hungry for his maiden victory, whose Lola had suffered clutch problems the day before. The top five in this first session were Luyendyk (118.636 mph), Mears, John Jones, Scott Brayton and Tero Palmroth. In the group two qualifying, Danny Sullivan put in a 118.687 mph lap, fastest of the weekend to date, to vault ahead of Arie and claim his seventh Indycar pole position. Mears and Al Unser Jnr’s March qualified for row two, followed by the Lolas of Mario Andretti (with Chevrolet power) and Bobby Rahal (Judd). Derek Daly reported that he was disappointed in only qualifying tenth. “The boost problem persisted,” he said, “and the car developed understeer”. Mario’s son Michael Andretti said his March was “sliding all over the place. It was pretty good this morning and no darned good this afternoon.” He would up eighth. Raul Boesel, World Sportscar Champion and currently second in the CART championship standings, struggled for grip, while Porsche’s Teo Fabi seemed satisfied at claiming ninth place on the grid. “We have a good balance in the chassis,” he said, optimistic about his chances for the race. Pole-man Sullivan led the 26-car pack from Luyendyk, Unser and Mears at the start. Andretti father and son were next up, followed by Emerson Fittipaldi and Rahal. Raul Boesel stalled and retired just beyond the pit exit, after only two laps; reigning Champion Rahal had earlier stalled on the grid but had been restarted. On lap 14, when he came upon Rocky Moran’s March in turn nine, race-leader Sullivan half-spun, jumped the curb and tore through the grass. He re-joined without sustaining any damage, but Luyendyk had sneaked through into the lead, followed by Unser Jnr (“Little Al”). Sullivan is getting into a habit of spinning and winning. 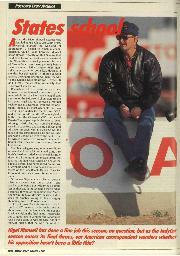 His most famous moment was at Indianapolis in 1985, where he survived a 360 deg pirouette and still ended up the victor. With 30 laps completed, Sullivan’s Penske was putting Little Al’s second position very much in jeopardy, the leading bunch now being Luyendyk, Little Al, Sullivan, Michael and Mario Andretti. Rick Mears was the first of the leaders to pit for tyres and fuel, in just 14.84 seconds, but Danny Sullivan who stopped two laps later was replenished with fuel and four tyres in an amazing 13.5 seconds. During the pit stops, Michael Andretti led for a lap, before pitting himself. Howdy Holmes’ car ended up stationary in an unsafe position on lap 40 after Michael had given him a bump, resulting in the yellow flags being shown, and Andretti had to make a critical pit stop for repairs which pushed him way down the field. The pace car held up the race for five laps. A few minutes later, the racing was again stopped, this time owing to Daly and Lewis making contact. 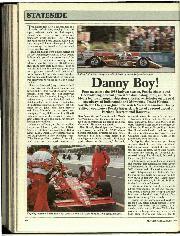 The drivers nearly came to blows but Daly was to continue until his driveshaft broke up on lap 74. These interruptions to the proceedings produced the most exciting moment of the race. As the green flat was shown on lap 52, Luyendyk, Sullivan and Little Al steamed up the main straight side by side, the grandstands coming alive with noise. “Beautiful!” Luyendyk said afterwards. “A great racing moment… I was looking at Danny, keeping as close as possible, and then all of a sudden there was somebody else next to me!” Sullivan emerged the leader for a lap, but Luyendyk then forged ahead. 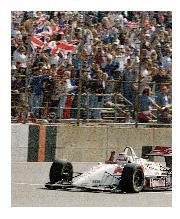 Unser Jnr ran third, with Fittipaldi and Andretti Snr following. Sixteen laps later, Luyendyk headed for the pits again, allowing Al Unser Jr and Sullivan to lead for a lap each until they themselves took on more fuel and new tyres. Little Al’s pit crew blew his chance of repeating his 1984 victory here, when an air-block in the Valvoline March’s fuel-hose forced him to spend 32.8 seconds kicking his heels in the pits. 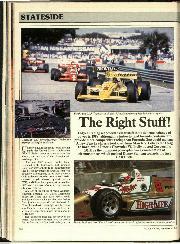 When the last of the leaders, Fittipaldi, made his stop, Sullivan again headed the field, a lead he was able to consolidate. He finished a little over 17 seconds ahead of Luyendyk, who nursed his car home with third gear missing for his best ever finish. Fittipaldi was third – his third top-three finish in a row. 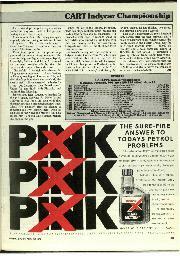 Sullivan’s victory was his eighth in 71 Indycar starts. Once a New York City cab driver and member of Ken Tyrrell’s F1 team in 1983, he had not tasted champagne for 29 races, but proved at Portland that he is still a force to be reckoned with. “I’ve never finished here before,” said Danny. So far this season, he has finished two races, and claimed a first and second. This year’s Budweiser/GI Joe’s Portland 200, named after the beer company and a chain of hardware shops which sponsor the event, recorded the biggest crowd ever for an Oregon sporting event – 51,000 on race-day and a total three-day figure of 102,600. In fact CART is attracting a growing interest from racing fans worldwide, not just from within North America.